All - looking to get my first stick burner and I have settled on the Kingman. 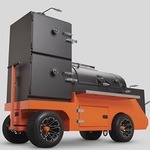 I have plenty of room for such a cooker and I"m looking forward to replacing my fleet of BGE with a single smoker. Question - the weight it listed at nearly 1,000 pounds - at that weight will I be able to move it around at all? I'm wondering fro the most basic of taking off my trailer when I bring it home all the way to just having to move it around to clean around etc. Thoughts? Moving it short distanced on a hard surface is doable. Loading and unloading from a trailer is not a one person job. How much more fuel does to use for a typical session? Please give our Sales Team a call at 877.409.6337, option 1, or contact via email at info@yodersmokers.com. They will answer all of your questions and concerns. 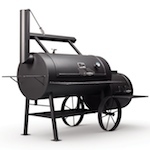 Thank you for your interest in Yoder Smokers products!